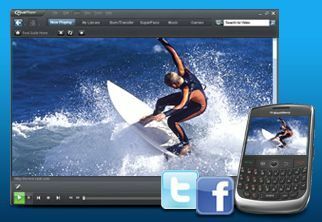 Looking for a smarter, more convenient solution to get Internet video onto your mobile devices? The leading provider of digital entertainment services, RealNetworks, Inc. has launched its new RealPlayer SP software application, the ultimate, convenient solution for easily converting and transferring web video (such as Youtube, Google Video, Break, Metacafe, MySpace, iFilm, DailyMotion and many more popular web video host) to mobile devices including iPhone, iPod, BlackBerry Bold, BlackBerry Curve series, BlackBerry 8800 series as well as BlackBerry Storm smartphones, allowing users to carry clear and vibrant Internet video with great sound quality wherever they go, aiming to give users the best mobile video experience. The RealPlayer SP Beta application is now available as a free download from its official Website at real.com, while the RealPlayer Plus SP (premium version) that supports H.264 video conversion, DVD playback and DVD burning is available for about $40.